Lower Digestive Tract, 2nd Edition, part 2 in the 3-book Digestive System volume, covers the small bowel and colon, and provides a concise and highly visual approach from normal anatomy and physiology through pathophysiology, diagnostics and treatment . 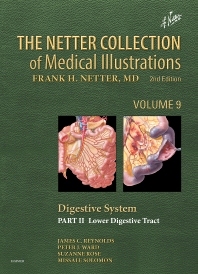 This book in The Netter Collection of Medical Illustrations (the CIBA "Green Books") has been expanded and revised to capture current perspectives in gastroenterology from the basic sciences to clinical pathology. It features radiologic and pathologic images to supplement the classic Netter illustrations, as well as new illustrations. This updated classic is ideal for students and health professionals seeking an easily accessible guide to the lower digestive tract. Gain a rich, comprehensive overview of the lower digestive tract by seeing classic Netter illustrations side by side with cutting-edge radiologic and endoscopic and laparoscopic images. Explore key topics in gastroenterology, including genetics of colon cancer, Celiac disease, and Crohn’s disease. See modern issues in digestive health and disease captured in the visually rich Netter artistic tradition via contributions from artists working in the Netter style. Get complete, integrated visual guidance on the small bowel and colon in a single source, from basic sciences and normal anatomy and function through pathologic conditions. Benefit from the knowledge of a team of renowned clinicians and scientists.